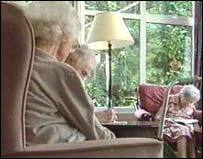 Nearly half of England's nursing and care homes fail to meet minimum medication standards, inspectors say. The Commission for Social Care Inspection found cases of people given the wrong medication, drugs in the wrong dose or no medication at all. Staff are often poorly trained and records are not kept properly, the report on 19,500 homes said. The Department of Health said more were meeting the minimum drug standards, but acknowledged there was more work to do. The inspection found that minimum standards on medication were not met in more than 5,000 of 11,500 homes for older people and in more than 3,000 of 8,000 homes for young adults. Some 210,000 people live in these homes, many of whom are severely disabled or have long-term illnesses. Commission chairwoman Dame Denise Platt said: "Giving people the right medicine, in the right doses, at the right time is critical. She said all care homes must keep proper medication records and ensure staff are properly trained. The report urged primary care trusts to ensure medicines management is prioritised and that support is given in developing safe working practices. The commission said it would continue to monitor performance through unannounced and pre-arranged inspections. National Clinical Director for Older People Professor Ian Philp said: "We will work tirelessly to ensure that all our older people are treated safely, effectively and with respect for their dignity." He added that the majority of older people had had medication reviews in the past 15 months and that guidelines had been produced to help patients make the best use of these reviews. Sheila Scott, chief executive of the National Care Association, which represents care professionals in the independent and voluntary sectors, said she was very disappointed at the report's findings. "We want to be sure that in two years' time, when the next report is published, there has been a dramatic improvement in the way medication is handled in care homes. "We are calling on the government and the Commission for Social Care Inspection to work with us to find practical solutions to one of the most complex areas of work in a care home." A commission report in 2004 highlighted that homes were performing poorly in this area. This latest report found that despite some improvement, too many homes are still failing to meet the national minimum standard. Shadow health secretary Andrew Lansley said the results were "deeply disturbing". "Like hospitals, all nursing and care homes must make use of every mechanism to minimise mistakes. It is vital that patient confidence is restored." Liberal Democrat health spokesman Steve Webb called on the regulator to "get tough" and impose severe penalties on care homes who fail to ensure that medication is properly managed. "I am very concerned that too many elderly vulnerable people living in care homes are not receiving the highest standard of care when it comes to the management of their medication. "The fact that there has been so little improvement is a source of particular concern." Chief executive of the Alzheimer's Society Neil Hunt said: "This shocking report highlights the poor quality of care many people in care homes receive. "It is of particular importance to people with dementia who are unable to administer their own medicine."